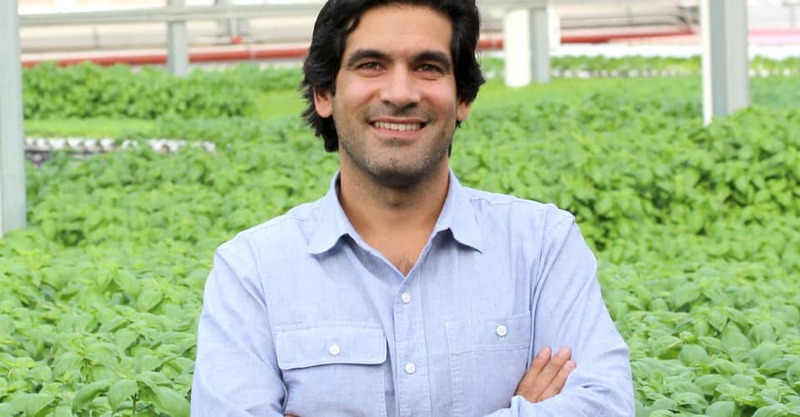 Viraj Puri is the co-founder and CEO of Gotham Greens, a global pioneer in urban agriculture and a leading regional producer of “hyper-local, premium-quality, greenhouse-grown vegetables.” Gotham Greens operates several commercial scale, renewable-energy powered, urban greenhouses in New York City and Chicago that provide premium=quality produce year round. His previous work includes developing and managing start-up enterprises in New York City, India and Malawi, with a focus on sustainable agriculture, green building, renewable energy, and environmental design. Puri is also a writer, contributing to several books and publications including, 100% Renewable — Energy Autonomy in Action and the UN Academic Journal; and has received fellowships from the TED conference, Wild Gift, and the Environmental Leadership Program. Food Policy Center (FPC): What initially motivated you to pursue sustainable agriculture? Viraj Puri (VP): My partners and I were inspired by innovation and technology and driven by a sense of duty to address the ecological issues facing our agricultural system. Agriculture has an enormous impact on our natural resources and is the largest user of land and fresh water on the planet. It’s also the leading cause of global water pollution. At the same time, the vast majority of produce we have access to in east coast cities is being trucked long distances from places like AZ, CA, Mexico and even further away. Inefficiencies in the supply chain mean that as much as 40% of that food is being thrown out between the farm and the plate. Meanwhile, 1 in 6 Americans are facing food insecurity. We realized that in order to make an impact on food access, climate change and public health, we needed to come up with a solution that addressed these food issues. Urban agriculture is one solution and we believe it has a significant role to play in the future of a more sustainable and just food system. FPC: What challenges did you face when you were building your first commercial urban-agriculture greenhouse? What challenges do you think were specific to the landscape of NYC? VP: When we built our first urban greenhouse back in 2011, there was really no precedent for what we were trying to accomplish. The challenges were significant given that we literally and figuratively had to create our blueprint for a commercial scale urban agriculture company. In NYC specifically, the biggest hurdles have been logistical and regulatory challenges around zoning approvals and permitting, which are specific to building in such a densely populated urban center. In addition, starting operating a business in NYC typically comes with higher upfront and operating costs compared to other cities and regions. FPC: You now have four high-tech, environmentally friendly greenhouse facilities, three in NYC and one in Chicago, staffed by 150 people working to grow fresh vegetables for local distribution. However, you mentioned in a recent interview that when you built your first urban greenhouse back in 2011, “there was really no precedent for what we were trying to accomplish.” What were the most significant factors that enabled Gotham Greens’ rapid success? VP: The primary factors are hard work, dedication and a strong conviction that high-tech, ecologically sustainable urban agriculture can play a significant role in addressing issues around food. But the concept alone is not enough to be successful. While technology is an enabler, plants are not widgets and you can’t just manufacturer crops. Growing high quality, highly perishable products in a refrigerated supply chain is hard work. From the very beginning, we’ve prioritized quality, consistency and exceedingly high food safety standards. Operating a successful business in the agtech space takes a complex and multifaceted approach that includes sales, marketing, operations, logistics, real estate and human resources. Building a great team of smart and committed employees has been key to our company’s success. FPC: You describe your business model as a “modern agricultural company producing high-quality produce in cities for urban residents grown with a smaller environmental footprint.” Can you explain how that model affects low-income communities? VP: Growing fresh produce in close proximity to city centers means that we can make it available to urban customers within hours of harvest instead of days. With superior taste, increased freshness, and better shelf life, we provide our end consumer with a more positive experience and value for their money. Our line of packaged salads, herbs and fresh food product are available in a wide variety of stores that target a range of income levels including large national retailers like Whole Foods Market and Target, regional supermarkets like Food Towns and ShopRites as well as neighborhood markets and co-operatives. Our salad and herb products are competitively priced and typically retail for $2.99- $3.99, which is on par with competing products. 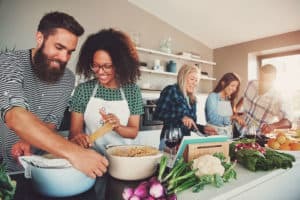 Part of our mission as an urban agriculture company is to connect city residents to their local food system and to help build awareness around healthy eating and sustainability. Examples include but are not limited to: hosting free weekly tours at some of our greenhouses in both NY and Chicago so we can show consumers exactly where and how their food is being grown; donating over 30,000 plant seedlings to local wellness education and environmental stewardship initiatives throughout NYC + Chicago; supporting food rescue organizations such as City Harvest, West Side Campaign Against Hunger and Greater Chicago Food Depository help us distribute fresh produce to our neighbors facing food insecurity. FPC: You also stated that your startup is a “local produce brand on a national scale.” Can you talk about how communities around the country would benefit from having an agtech startup like Gotham Greens despite their socio-economic and demographic differences? VP: Urban farming makes use of space that wouldn’t traditionally be used for agriculture such as former industrial sites, rooftops, backyards and parking lots. As leaders in the urban agriculture space, we seek to lead by example and operate our business with a truly triple bottom line approach. We don’t just blindly talk about being “local” “sustainable” and “natural”. While our business is about those things, we care about what those things stand for: flavor and nutrition, preserving water and soil resources, biodiversity, reducing harmful chemical use in food production, fair treatment of workers, and spending our dollars closer to home. As we scale from a regional company (currently in the NY Tristate and Chicago) to a national one, we strive to create meaningful local partnerships to further our mission. Our project on the South Side of Chicago in a neighborhood called Pullman is a great example of this. Since expanding to Pullman in 2015, we’ve been able to partner with local schools and nonprofits to help increase green space and food access within the neighborhood. Pullman has seen a resurgence of jobs and investment into the neighborhood including the opening of the new Whole Foods Distribution Center as well as a brand new $20 million indoor sports training facility at the Pullman Community Center. Earlier this year, we announced that Gotham Greens is doubling down on our commitment in Pullman and will be opening an additional 100,000+ sf greenhouse adjacent to our existing greenhouse. By the time we complete this second project, Gotham Greens will have produced over 120 full time jobs on the South Side of Chicago. FPC: There’s talk that Gotham Greens will be opening a 100,000 hydroponic greenhouse in Baltimore in the near future. Based on your experience in New York and Chicago, what positive effects do you foresee this new facility having in Baltimore? VP: We’re excited to be expanding to Baltimore with our new 100,000 sf+ state of the art greenhouse at the site of the Bethlehem Steel Plant, a former steel mill. The expansion, on this formerly contaminated site, will create 60 new jobs and will allow us to bring our line of salad, herbs, dressings and pesto to local supermarkets, restaurants and food service customers throughout the Mid-Atlantic region. Similar to our other 4 facilities in NYC + Chicago, this new greenhouse will use 100% renewable electricity, recycled irrigation water and integrated pest management. We’re also excited to team up with local schools, community gardens and food pantries throughout Baltimore County to support environmental education and wellness programming throughout the region. FPC: This year, President Trump’s escalating trade war has both directly and indirectly affected various aspects of agriculture and consequently affected the value of American crops. Additionally, the tariffs on steel and aluminum, for example, have caused China, Mexico and Canada and the EU to impose retaliatory tariffs of their own. Has the current political climate and recent tariffs affected your work at Gotham Greens? If so, why? VP: Fortunately we have not been largely impacted by the recent tariffs. FPC: What is the one food policy change at the federal level that you believe would have the greatest impact on environmentally sustainable food production in the United States? VP: The recent E.coli issues related to lettuce production from CA and AZ underscore the need for more transparency in our food systems. This means knowing when, how and where our food was grown. Until the most recent E.coli outbreak in November, farmer’s weren’t required to say where their product was grown. The government can continue to do more to support transparency within our food systems by requiring better food safety standards and traceability implementation of FSMA.